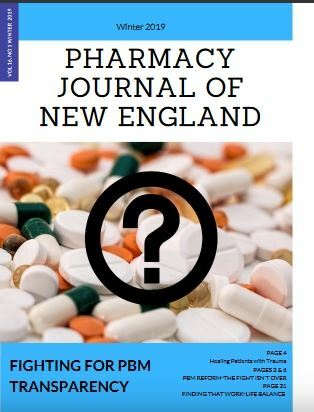 The Pharmacy Journal of New England (PJNE), a quarterly membership and pharmacy journal, is a joint venture of The Connecticut Pharmacists Association and the Massachusetts Pharmacists Association. The PJNE is circulated electronically to over 3,000 pharmacists, pharmacy students, and other healthcare professionals (physicians, hospitals, wholesalers, industry, academia) in New England and throughout the U.S. The PJNE includes U.S News, State Association News (contributing associations include the Rhode Island Pharmacists Association, the New Hampshire Pharmacists Association, the Vermont Pharmacists Association and the Maine Pharmacists Association), University/Colleges Update (University of Connecticut School of Pharmacy, University of Rhode Island College of Pharmacy, Northeastern University - Bouve College of Pharmacy & Health Sciences, and Massachusetts College of Pharmacy & Health Sciences (Boston & Worcester), Rx and the Law, Continuing Education, and much more!